Good morning, beauty! Today’s suggestion may make us more alluring to the people we meet but that isn’t the point. You can do this easy thing today and bring calm, or focus, or a feeling of sensuousness to your day. Your choice. Perfume can be lovely but I’m suggesting you get yourself a simple essential oil for therapeutic and sensory benefit. 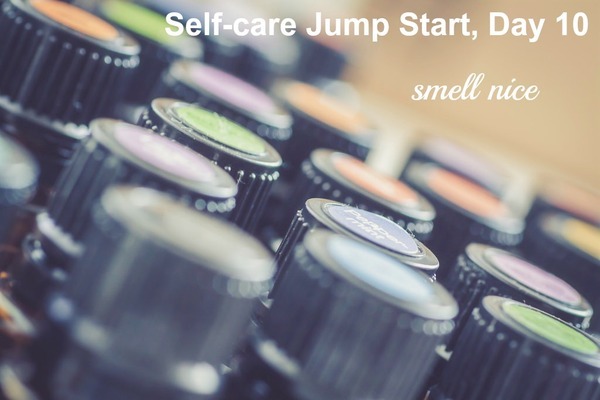 Unlike commercial perfumes (which can smell nice but can also be toxic for you and allergy-triggering for the people around you) essential oils bring physical and emotional benefits, and are totally customizable to you. They are easy to find at any natural foods store. They aren’t cheap but a half-ounce bottle will likely last you years. Try sandalwood for deep relaxation and nervous system calm. Rosemary or any citrus will enhance energy and concentration. Try French Lavender for emotional calm and uplifted mood. (Spike lavender is less expensive but it doesn’t smell as nice. It is terrific for cuts and scrapes, though.) All of these have immune-enhancing properties in addition to their lovely scents. An important note: Always use a carrier oil when you use essential oils. For a light scent, this means mix two or three drops of essential oil in a teaspoon of some other oil. I like coconut and jojoba. Do not apply essential oils “neat,” without diluting first. And stick with just two or three drops. You can work your way up to 5 after a couple of weeks of use with no problems, but more isn’t better in the case of essential oils. They are powerful and that is good, but it also means that too much can hurt you. Have you used essential oils? Do you need ideas, have questions, or want to share your favorites? Leave a comment below to talk about it. This entry was posted in Daily Delicious (Blog) on January 10, 2018 by kfairbanks a search for delicious.